NORAD's Santa-tracking story is a story that gives us all a reason to believe during the Christmas holiday. It's been a favorite thing to do for kids and parents alike for over 50 years, and it remains one of the best examples of true Christmas spirit out there. Each year, thousands of families across the world tune in to NORAD to track Santa Clause as he delivers presents on Christmas Eve. The North American Aerospace Defense Command (NORAD) has been the primary source for tracking Santa Clause on Christmas Eve for over 50 years, and they take Santa tracking seriously. But how did NORAD get tasked with this huge responsibility each Christmas? And how, exactly, do they do it? NORAD, by the way, is an organization in charge of aerospace control and protection in North America, so it only makes sense that they're keeping an eye on everyone flying around out there. As a cooperative effort with Canada, the organization is responsible for monitoring and protecting national airspace, aircraft and other objects in space. There are three basic functions of NORAD: Aerospace control, aerospace warning, and maritime warning. Aerospace control encompasses the control of all national airspace and air defense. Aerospace warning involves keeping the nation's airspace safe from outside attacks and protecting our country from missiles, aircraft and other aerospace technologies that could interfere with national security. NORAD offices are located at Petersen Air Force Base in Colorado, side by side with the U.S. Northern Command (USNORTHCOM) command offices. NORAD's Santa-tracking program began entirely by accident. In 1955, NORAD was operating under the name CONAD, which stood for Continental Air Defense Command. One Christmas, a department store printed the wrong number on an ad that encouraged children to make a phone call to Santa Clause. The wrong number rang through to the (CONAD) office instead of the department store, and kids called NORAD that night asking for Santa. Colonel Harry Shoup, the program's Director of Operations, answered the phone that night. When he discovered what was going on, he was kind enough to play along, telling the children where Santa might be based on his radar data. Colonel Shoup began a tradition that year that stuck, and NORAD employees have been watching the skies for Santa on Christmas ever since. Over the years, the NORAD Tracks Santa program has grown to include a large platform of volunteers, a website and merchandise sales, along with the actual Santa tracking event. On Christmas Eve, hundreds of volunteers gather at the NORAD Command Center to answer phones and field emails from children all over the world. Volunteers track Santa's position using radar, satellites, special Santa cameras, and fighter aircraft. According to NORAD, the organization uses the North Warning System, which is a series of 47 radar systems across North America. In addition, heat sensors on satellites can detect Santa's whereabouts, as well. 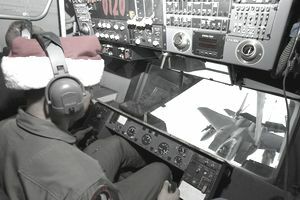 Fighter aircraft such as the F-15, F-16, F-22 and CF-18 fighter jets are flown to intercept Santa, making sure the skies remain safe and Santa isn't interrupted by other flying objects on Christmas. Today, the NTS program has hundreds of volunteers and takes thousands of calls from children on Christmas. NORAD maintains a very large online presence, alerting the press of Santa's movements and posting his updated locations online for the world to see. NORAD also operates a website and various social media platforms, used to reveal videos and pictures of Santa Clause. The NORAD Tracks Santa website also has games for kids to play online while they wait for Santa to come. The "FAQ" section of the NTS website answers many popular questions, such as what Santa looks like, how he manages to get to everyone's house, and if he has ever been photographed by NORAD. The site also includes an aviation favorite: Santa's sleigh specifications, which tells us that the length of Santa's sleigh is 75cc (which stands for candy canes) and the weight at takeoff is 75,000 gd (gumdrops). And in case you're curious, according to NORAD, Santa has never crashed his sleigh into anything. This year, NORAD is still working hard to make sure the kids of the world know where Santa is every moment leading up to Christmas while protecting the skies over North America at the same time. How great is that? Will you be tuning in to track Santa this year?